You are currently browsing the Breaching The Web blog archives for May, 2006. Lately, I’ve become a big fan of Dagoba Chocolate. My first thought upon seeing it in the store was “why hasn’t Lucas sued them?” The label helpfully informed me that Dagoba is the Sanskrit word for temple — the idea being that chocolate is a sacred food. In the ingredient list of all their chocolates, the thing listed is “of course, love.” It makes me smile every time I read it. Some of the Dagoba ingredients are Fair Trade Certified, but even those that are not are bought directly from producers that the company knows and works with to ensure safe and fair working conditions for employees. But the very best thing about these chocolates is the flavor. They sell many grades of dark chocolate, my favorite is the Conacado. They also sell many innovative flavors, like Mon Cheri (cranberries and cherries), Chai (just like the tea), Lime (just like it says), Lavendar (ditto), and Xocolatl (chilies, cacao nibs, maca, nutmeg and vanilla). My two favorite flavors are Mon Cheri and Xocolatl. So good! And as if that weren’t enough, Dagoba is a small, family-owned company. All the bars are made here in the U.S. in a small town in Oregon. This is a chocolate you can enjoy without guilt! I picked up the new Dixie Chicks CD after hearing some bits of several songs on the radio. For many years I have wanted to like the Dixie Chicks, but I haven’t quite been able to. You see, I can’t abide twang. It makes my skin crawl. My aversion goes back many years, to a long, meandering road trip from Arizona to Oregon, with many stops to see relatives, in a hot car with no AC in June accompanied by my Grandma and her Sons of the Pioneers cassette tape, which got stuck in the car’s tape player. The tape player that automatically played whatever was in it and couldn’t be shut off. My Grandma decided that listening to the same thing over and over and over again was better than listening to nothing, so she wouldn’t turn the volume down, and we listened to the Sons constantly for a whole day and a half of desert driving, until I snuck out of my aunt’s house in the middle of the night with a butter knife and pried the tape out of the player. Now, it should be pointed out that the Sons of the Pioneers did Western music, not Country music (back when there was a difference between the two), so the amount of twang is limited. But twang it did for 18 HOURS OF 55 MILE-AN-HOUR DRIVING IN THE HOT DESERT IN THE SUMMER WITH NO AIR CONDITIONING (recall that my Grandma was with me — she would not allow me to exceed 55 miles an hour under any circumstances, even when the road kills outnumbered the living things we saw by 5-to-1). So, the Dixie Chicks. Even though I have really wanted to like the Dixie Chicks, I haven’t been able to until this album — their big cross-over effort. There’s not a lot of twang on this album. Even the twangiest of the songs — it’s a toss-up between “Silent House” and “Bitter End” — doesn’t twang much. There are some real gems on this album, like “Lullaby” (which I suspect would appeal strongly to Allison Krauss fans). But there’s also not much that’s surprising — this is a very mainstream Country/Rock cross-over album. Shania Twain comes to mind (the early cross-over Shania, before she started trying too hard). Much has been made of the “mom rock” theme of this album. I don’t think it would have struck me that way had I not already heard it described this way. However, it definitely deals with themes that adult women face — child-rearing, caring for an elderly ailing relative, finding time for romance, finding time for yourself, working at relationships, and so on. I’m enjoying the album, and I recommend it. Some days it seems like the world is getting more and more degraded — we only use nice table manners in fancy restaurants (and eat like barbarians the rest of the time), we talk in movie theaters, we don’t know their neighbors first (let alone last) names, our food is over-processed and poisonous, TV panders to the lowest common denominator, we only expect people to pitch in if there’s “something in it for me” and so on. But this is the most horrifying example I’ve seen yet of the complete degradation of communal life. Mark Osterloh, a Tucson, Arizona doctor, has led a drive to put an initiative on the November 2006 ballot that, if passed, would create a lottery for voting. Everyone who casts a ballot would be eligible for a $1 million jackpot, the winner to be selected at random. Voting is a public duty. We should do it because it’s part of our communal existence, a gift from the founders — not because we might win some cash. Reducing this sacred, precious right to a state-sponsored gamble is offensive in the extreme. The yarn is Colori Sock it to me! in a pretty pinky-purpley-redy-bluey colorway — the picture doesn’t do it justice. 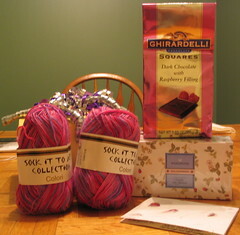 I can’t wait to knit it up socks — definately socks for me. The Ghirardelli chocolates are raspberry filled — these things are quite rich. One is quite satisfying. The tea is a strawberry flavored tea from Wedgwood that I haven’t tried yet — I’ll be sipping it tomorrow. But best of all is the note Marie wrote me — it’s really thoughtful, and I really enjoyed it. Updated: I got the blog name of my partner wrong and edited this post to correct it. In Food for Thought, Lance Hosey discusses the historical links between food and architecture, and the way both are becoming homogenized in the modern world. It’s, well, food for thought. The 2006 Maryland Sheep and Wool Festival has come and gone — and I spent a lot of money. I of course bought yarn. A lot of it. I went on a bit of a Koigu rampage — I bought 9 skeins of it (I already had 3 of the skeins in the picture below — the blue/green ones that are wound into balls). I plan to knit Charlotte’s Web just as soon I get some other projects out of the way, and I will most likely also make one or two pairs of socks from the remaining Koigu. I also bought a skein of Opal sock yarn that will become a Christmas gift, and 3 skeins of some pretty teal DK weight wool that will most likely become a shawl of some sort. I love the colors of the Koigu — just looking at them makes me feel good. 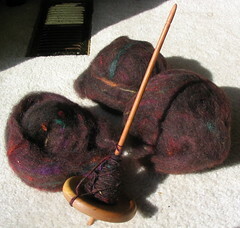 I also bought a bit of roving and a bottom whorl spindle — I’ve tried hand spinning before, but only with a top whorl spindle, and with some roving that wasn’t as nice as this. My friend B convinced me to give it another try. I definately like it better than I did before, but I’m not sure I’ll ever be a spinner. Updated: I changed the size of the pictures because it was screwing up the way the site looked on some computers/browsers. About a week ago, I got this neat set of containers for my lunch — it’s an Americanized bento box made in the US by a company called Obentec. They sell this and other products at Laptop Lunches. What I like most about the set is the way the containers all nestle efficiently together. It’s small, but it holds a lot. The tiny yellow container holds about 1/3 of a cup and has a lid. The two medium containers hold about 3/4 of a cup. The two larger containers hold about 1-1/2 cups, and one of them (the green one) has a lid. You can put about 4-1/2 cups of food in the set total, which is more than enough for me. The fork and spoon are smaller-than-normal, but they work just fine and fit neatly into the slot to the right of the inner containers. 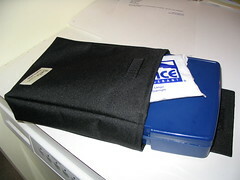 I also bought a sleeve and ice pack for the set. 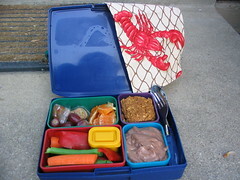 The sleeve is not insulated, but my lunch stays cold for about 5 hours in spite of that. The sleeve doesn’t fit tightly, so there’s room to slide a cereal bar in with the ice pack, on days when my lunch doesn’t seem very substantial. I’m on the lookout for a small snack container that I can slide into the sleeve, something about 2×2x1, to put a small amount of nuts or dried fruit in. I made the cloth lobster napkin — it’s small, about 6.5 by 12 inches — but it fits nicely under the fork and spoon, and it’s more than enough for lunch. So far, it’s one of a kind, but I plan to make some others out of fun fabrics. 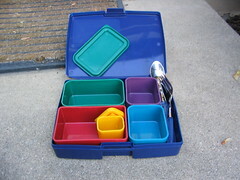 I like getting my lunch ready using this system — when each little container is full, you’re done! It adds a structure to lunch prep that I find really helpful. I liked this set so much that I ordered one for my husband too! Oh my. Oh-my-oh-my-oh-my. I just saw Lisa Souza’s Sock! yarn for the first time. The painted colors are breathtaking. I’m disappointed that she won’t be at Maryland Sheep & Wool, but I noticed that she’ll be at Stitches East in November — just in time for holiday knitting! This chocolate pudding is a good, healthy way to get your chocolate fix. I sweetened it with a blend of sugar, splenda and stevia, which makes it even lower in calories and easier to fit into your diet if you are minding your carbs. I didn’t have any vanilla on hand, so I used almond extract instead. Heaven.